Edmund Culpeper, born in the late 1660′s, was apprenticed to Walter Hayes, a famous engraver and instrument maker of Moorfield, London. The elaborate hand engraving of this microscope is an exact duplicate of the original. This instrument was reproduced from the original antique microscope #0204 in the McCormick Collection. The brass tripod foot is an adaptation of a 4 1/2" sector. A turned pillar rises 6 1/4" from the sector center, terminating in a ball and socket joint with a slot cut away to permit upright position of the microscope. The modified Bonanni stage has a steel spring, two brass plates, and a third curved brass plate and leather pad to hold a slider or glass tube. A 3/4" condenser lens exists at the screw barrel end; a 1 1/4" condenser lens is mounted on the stand by a knuckle jointed arm. The 13/16" single concave mirror on a gimbal attaches to the pillar. The screw barrel brass body consists of a threaded screw and hollow sleeve. The compound body is made of ivory. The compound body contains one ocular at the proximate end. The screw-barrel has six simple lenses and one Lieberkuhn lens. The compound body contains one objective. Coarse adjustment is by means of a long screw and also with a draw tube for the compound instrument. 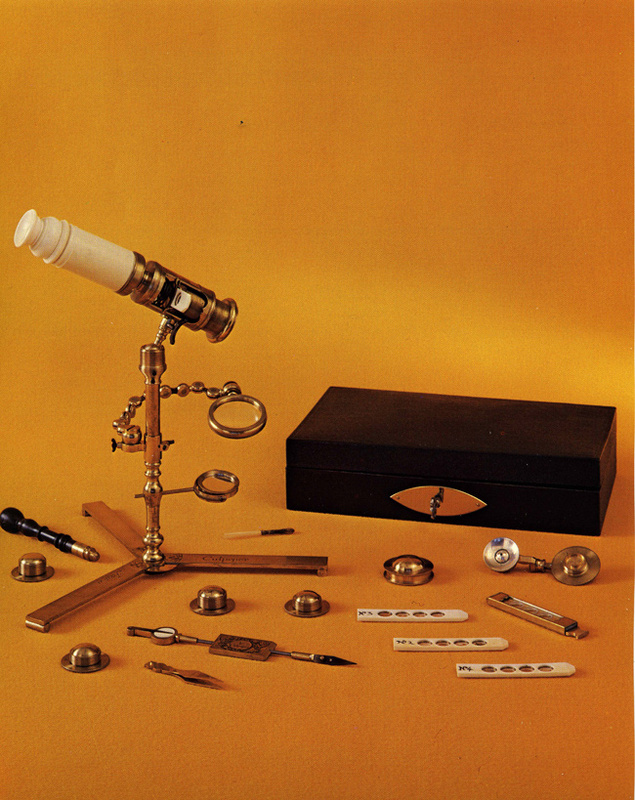 Accessories include brass tweezers, pencil brush, case for Lieberkuhn lens, ebony handle, extension of opaque objects, stage forceps, forceps plate, brass animalcule cage, and four ivory sliders. The black Moroccan skiver leather covered wooden case, 8 9/16" L x 5" W x 2 1/8" H, is lined with dark green velvet. The compound microscope closed is 5 3/4" long. The microscope on stand in horizontal position is 7 1/2" tall. "Culpeper Fecit" is engraved on two folding arms of the sector stand. Engraved along the hollow screw-barrel sleeve is "Culpeper Fecit. ", and on the forceps plate, while on the other, Culpeper's name is surrounded by a garland emblem. The sector stand has an ornamental motif at the base center. The simple lens mounts bear engraved numbers 1 through 6. The Replica Rara stamp and serial number is located on the underneath side of a sector foot.